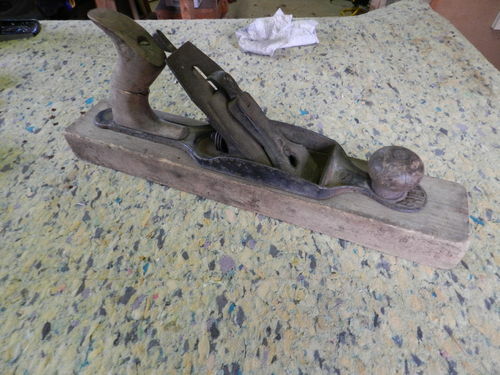 This will be my first go at restoring a wooden bodied hand plane. 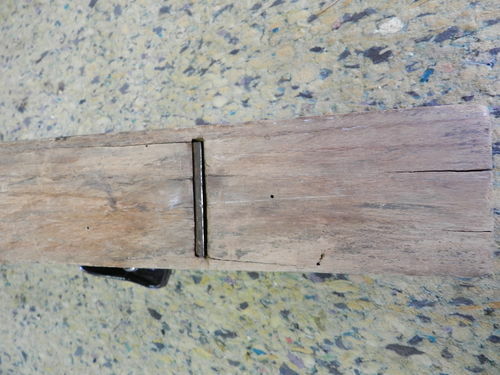 In the pics you’ll see it’s an older Stanley wooden bodied plane that is rusted up pretty bad. I can handle the rust issue with electrolysis like I’ve done many times before. As I’m typing this there are parts in the bath and last night I did the iron/blade….which is pitted pretty bad. But what concerns me are the checks in the wooden body and layers of gunk built up on the wood. In your humble opinion(s) what is the best way to restore this, or should I even try. Just leave it as is? I suspect getting the sole flat, edges square, and restoring the beauty of the wood is the challenging part but will I destroy the integrity of the plane in the process? I have many old planes and have several similar to your wood body. Easy and cheap to find on eBay. LOL I will make new wood bodies out of fine hardwood and rehouse the frogs as was intended at the time of the OEM, but keep the original bodies. I love to see maker’s marks in the old wood. 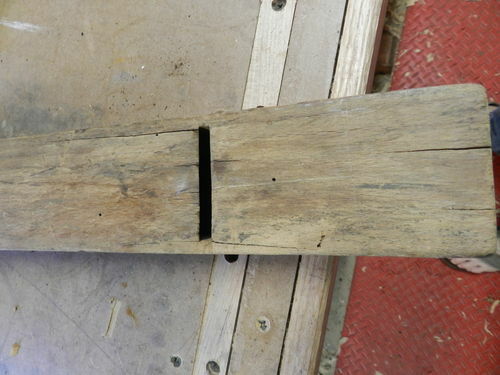 But another course you might research would be acetylation of the wooden parts. Google that up and since you seem to have an interest and knack for chemistry, you will find quite a lot of recent progress in processing wood with natural ingredients to make it much more stable, strong and water resistant. Its expensive for lumber in bulk but even now that is going into commercial production. For a small part, it can be done at home. Acetylanhydride is drawn into the wood after placement in a rough vacuum. It replaces the -OH groups that cover the wood fibers and hold in water with acetyl groups. After another heat treatvin air the acetyl polymerize. The result is all natural but stronger and more stable but works like harder wood and takes finish like fully sealed wood even after surfacing or sanding. I haven’t tried glueing or infilling acetylated parts but I expect infill would have superior bond strength and dimensional stability. I have one just like that, looks and works great! I agree that to see the marks from use on the top and sides looks great so to keep them is the way to go. Any brand or names never should be removed. 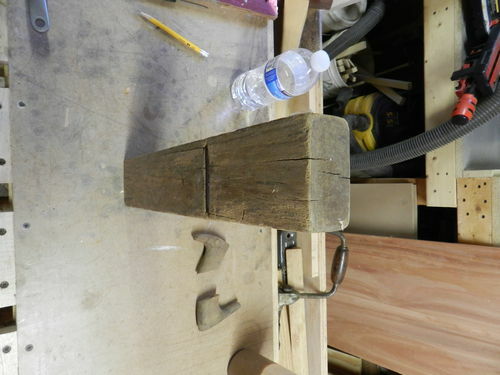 You will want to use this plane so to flatten the sole and true up the sides is good. Here is how I do both without harming the patina of the sides. 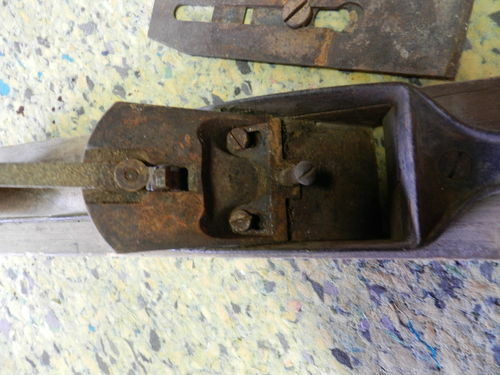 Start with checking the sides square from the top of the plane, it should be good as the blade housing is mounted to the top and the sole is the surface that gets out of true from wear. Make a planer sled from FLAT ply or anything that is 2x wider and longer than the piece. Hey just make the sled like 10” x 6’ you will use it for other stuff believe me. 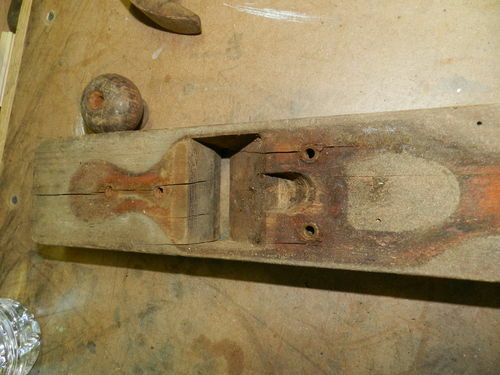 Mount the plane using the handle and knob threads to hold it tight to the sled. the trick to eliminate planer snipe is to mount blocks 6” longer and just wider than the work in front and in back as sacrificial snipe collectors. Now the sole will be parallel to the top and true to the sides. About the cracks, red2 has got me looking into that. I think it’s Minwax that has a wood hardiner product that soaks deep into the wood like tung oil making it harder. You might glue the cracks by the mouth but I would’nt bother with the rest. After a light sanding I like to use golden oak oil stain to give the wood a rich but not dark color, it really warms it up. I like to use teak oil followed by wipe on poly. Remember to use a blow gun to get all the gunk out of the cracks before you do anything and after every step including staining and the first few coats of finish, let each coat dry for 2 days as the cracks take time to cure. I don’t use poly on the sole just teak oik and after a month or so a good coat of wax. Hope this helps, this may be your favorite plane! About the metal, after cleaning it up paint is great but sometimes I just use teak oil to give it some protection while keeping the patina. red2; While I’m sure your technique works great, that’s way more work and research than I’m willing to invest time in. I do electrolysis becasue it’s easy, not because I have a knack for chemistry. That’s a multipley syllable word that scares me. But making a new body out of a really nice hardwood is a great idea. Studie; you gave me something to think about. I never would have thought about squaring it up using the top as the reference surface, but that makes real good sense. I’m afraid to run this through the planer because the wood is so old and probably brittle or dry rotted that I’m afraid it’ll break it to pieces. I also had asked Ed Lebetkin, who owns the old tool shop at Roy Underhill’s Woodwright’s School in Pittsboro, NC.. He believes that wood is quite old and very dry and soaking it in tung oil might do it some good. Out of all these options I’m leaning toward a new body. I don’t think the plane will ever become a useful piece to use. After soaking the iron in an electrolysis bath overnight I cleaned it up and sharpened it. The iron was so pitted from rust that with every fresh layer of metal it looks like there are chips in the blade. I guess it’ll just have to become a display piece in my man cave some day. I’ve restored a few similar. (several are posted here and on my blog) I would start by scraping the body then sand to 500 or so. Fill the cracks and soak in BLO. ^ I second the ‘use a scraper on it’ suggestion. It will freshen up the color without taking too much material. Once that’s done, you can always opt for a new body build. Sad about the pitted iron, but they’re relatively easy to replace so it’s not too bad.